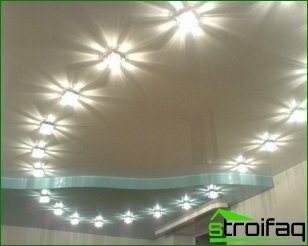 Correctly chosen lighting of premises- One of the most important components of a good repair. From that how well done lighting, mood depends not only family members, but the general atmosphere in the room. 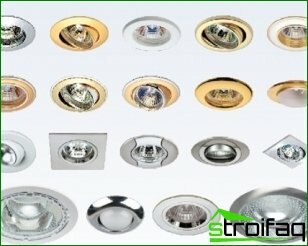 Therefore, choosing Bathroom lightingYou must be very careful and follow the advice and recommendations, which you will find in this article. Bathroom - this is probably one of the most important andfunctional rooms in a residential area. Here we provide a variety of hygienic procedures. In the bathroom of any person is able to relax after a busy day. Exactly because of this reason Lighting in the bathroom It should be functional, aesthetic, safe and comfortable. The main rule is that it should be remembered - Lighting in the bathroom should be plenty. Do not pick too dim lights, however, as much bright. You must decide what portion of the room more than any other needs good light. Also it is necessary to consider what the lamp will become the main source of light, and what - a decorative element of the interior. As a rule, there is always in the bathroomsa mirror which is located above the sink. Every day a person looks at it, and therefore it is very important to mirror the light was bright enough. The ideal situation would be the presence of the mirror self-illumination, then the light will be similar to daylight. 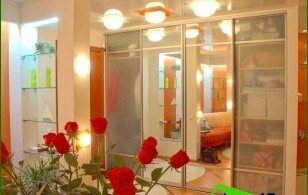 The best option for lighting a mirror - it's a two-way coverage. It provides plenty of bright light and no shadows on the face. But at the same time a light beam can hit in the eye. To avoid this, the light bulb must be well adjusted. It is best to use a mobile way of fixing lamps to change the direction and angle of the light, depending on the needs. For this purpose special brackets or flexible joints. 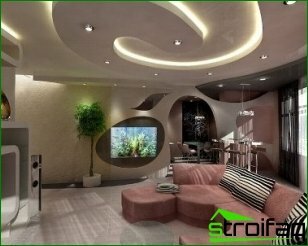 The overhead light should be bright enough, andevenly illuminate the room. 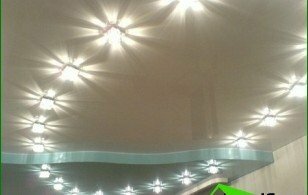 It is best to use halogen lamps with a large angle of dispersion. 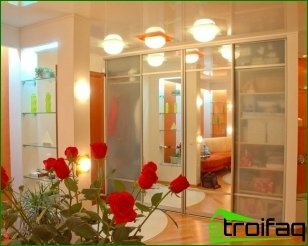 A perfect solution would be the installation of a power regulator for lighting lamps. This will contribute to a more effective relaxation and increased comfort while taking a bubble bath. The best - the enemy of good, as we should not forget. If the light bulbs in the bathroom too much, or they are extremely bright, the human body begins to experience stress. Moreover, leaving a bright room, the eyes need time to adjust to a different level of coverage. This adversely affects the vision. 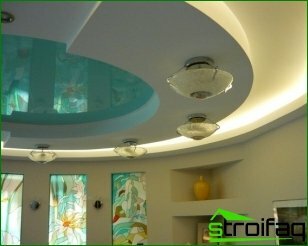 Of course, lighting the lamp to choose the best,based on the size of the bath room, its layout and interior design in general. Number of lamps depends on the size of the bath room. If your bathroom is not is large, there is no need to establish too many light bulbs. Conversely, if the bathroom is large and spacious, a couple of lamps you can not do. Many people use the bathroom is not so much forHygiene procedures, how to relax, and in this case does not interfere with the muted, intimate lighting. For example, it can be lights that mimic real candles, or the starry sky. It is worth a small low-power lamp, which can be placed slightly below the level of the bath, so that the light did not hurt his eyes. original approach Bathroom Lighting is the use of floor lamps. This solution is original, but in practice, its functionality is low. 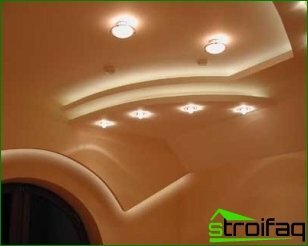 This type of lighting, many find it very creative, preferring the more traditional approaches to coverage areas. For example, so-called mobile fixtures. Of course, they do not look so impressive, as the other lamp lighting for bathrooms, But differ considerable functionality. These lamps can be turned in different directions, and even adjust the intensity of the color of light. Fans experiment manufacturerslighting can offer such an unusual form of lighting lamps as street lighting. 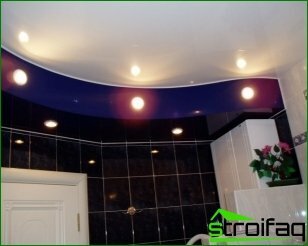 They are fairly easy to install on a wall or ceiling, are resistant to humidity and temperature changes. This lamp will give an unusual shade of vintage bathroom. A major advantage of this luminaire is its strength, reliability and durability. To date, the choice of different lamps on the marketlighting is quite wide. Consumer choice depends on the preferences, pricing, capacity and performance space.